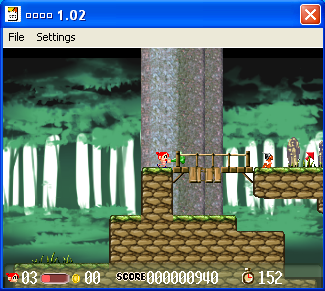 PONOPONO (38mb ver1.02 made by ISAmu, no install .7z) is an itty bitty Japanese platformer very similar to Super Mario Bros, only much, much smaller. 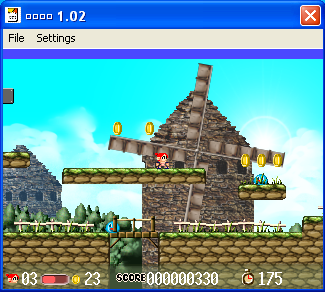 It's a timed level game and you must run, jump, and swing your club to receive goodies to collect. 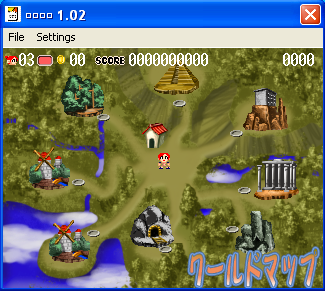 There are 8 little world levels in total. 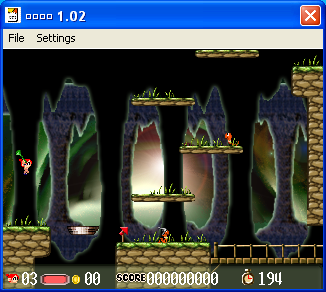 This is a great little game however the small size of the game screen window will have your eyes straining. If you can be bothered and don't have too many icons on your desktop, maybe reduce your screen resolution to the smallest size and you'll then get a bigger game window. There is no other way to maximize this window. Good game and a choice of screen resolutions and even full screen mode would have been perfect.